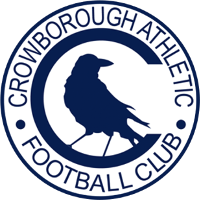 Crowborough Athletic were established in 1894 and spent much of their early history in local leagues in the Tunbridge Wells area. In 1974, the club joined Division 2 of the Sussex County League, winning the Division 2 cup in 1978. They remained in Division 2 for a decade before suffering relegation to Division 3 at the end of the 1983/84 season. However, it only took them three seasons to return to Division 2, a runners-up finish in the 1986/87 season enough to earn promotion. The club spent the next nine seasons in Division 2 before beating local rivals Stamco on the last day of the 1992/93 season to win the title and earn promotion to Division 1. However, they did not last long at that level, being relegated back to Division 2 at the end of the 1995/96 season. Things got worse for the club three seasons later with relegation back to Division 3, but they bounced back with promotion to Division 2 the following season, only to then suffer immediate relegation back to Division 3 at the end of the 2000/01 season. 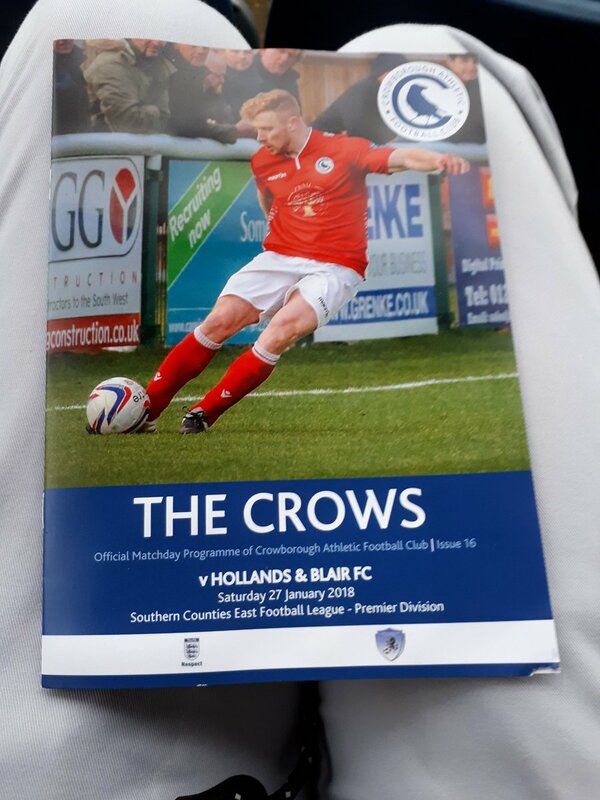 In the 2003/04 season, Crowborough began to climb back up the divisions of the Sussex County League, winning Division 3 and then winning Division 2 the following season. This was then followed by promotion to Division 1 South of the Isthmian League at the end of the 2007/08 season after winning Division 1, but their time at Step 4 was short-lived and they finished bottom to immediately return to the County League. After this relegation, the club initially struggled in Division 1 for a few seasons, but were able to stay up on each occasion. 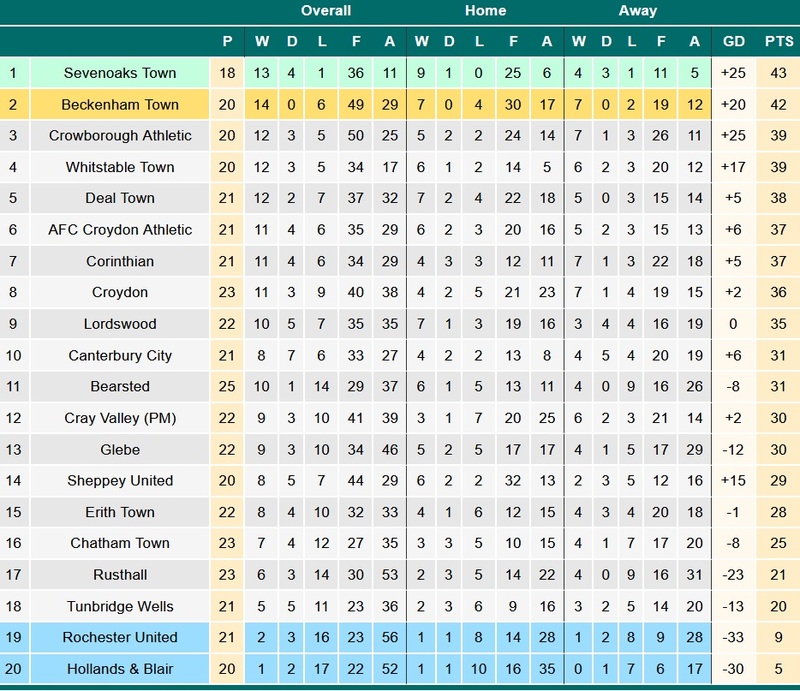 After finishing 5th in the league at the end of the 2013/14 season, Crowborough were transferred to the Southern Counties East League, where they have remained ever since, recording a highest finish of 2nd last season and fighting for promotion again this season. In the FA Cup, the club's best run saw them reach the 3rd Qualifying Round in the 2008/09 season, beating Ringmer, Walton Casuals and Leighton Town before losing to Harlow Town in a replay. In the club's one season in the FA Trophy (also 2008/09, incidentally), they reached the 1st Qualifying Round, beating Eastbourne Town before losing 2-0 at home to Northwood. As for the FA Vase, the club has progressed as far as the 5th Round on two occasions: in the 2007/08 season, they beat Hailsham Town, Chessington & Hook United, Brimsdown Rovers and Lymington Town before losing to Kirkham & Wesham (now known as AFC Fylde); last season, Crowborough beat Broadbridge Heath, Gravesham Borough, Banstead Athletic, Eastbourne United Association, Bedfont Sports and Eastbourne Town before losing 3-6 at home to Coleshill Town. Originally, I had planned to visit Abingdon Town yesterday, but the constant rain during the week made me decide against that plan (turned out to be the right call, as their game ended up being called off just 15 minutes before kick-off) and, after explaining the situation to Matt (who would be joining me for the first time since the Waltham Forest groundhop), I started to look for other options that would be equally interesting. After some investigation, I ended up with a shortlist of 6 options, including this, East Grinstead, Tunbridge Wells, Slough (as obligatory 3G backup) and a couple of others that I cannot remember). This was quickly narrowed down to this, East Grinstead and Slough and, after looking at trains on Friday night (so as to figure out the logistics of when and where Matt and I would meet up), I was forced to reluctantly rule this out as, for some reason, there was no option to book tickets for any of the viable trains to Crowborough. As such, come yesterday morning, I assumed that we would be going to East Grinstead, so long as the pitch survived the weather (which it did, with East Grinstead ultimately losing 8-1 to Whyteleafe). However, early in the morning Crowborough tweeted that their game was definitely on, so I decided to have a look at the trains again, hoping that I would actually be able to book train tickets after all: fortunately, this was the case (which makes me wonder why I couldn't on Friday night, but I digress), so I told Matt of the change in plans before we quickly sorted out where we'd meet on the way. After a train journey involving two changes (one at Redhill, then another at East Croydon), I met Matt on the train at East Croydon and we arrived in Crowborough at 2:10pm. We then had the fun of having to walk half an hour in the rain from the train station to the ground, eventually arrived 20 minutes before kick-off. We each paid £8 to get into the ground (way too steep for Step 5, if you ask me), and I grabbed a programme as well. After this, I went round the ground taking photos before we both sat in the main stand, with it still raining at this point. Ten minutes into the game, we went to get some warm food from the snack bar in the terrace behind the near goal, settling here for the rest of the game afterwards. 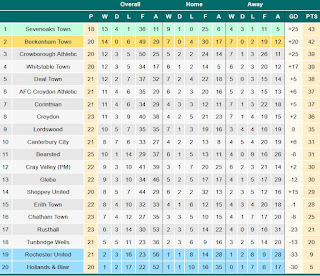 Looking at the table, the result seemed fairly easy to predict, with it seeming all-but-inevitable that Crowborough would have no trouble sweeping a struggling Hollands & Blair aside in their battle for promotion. 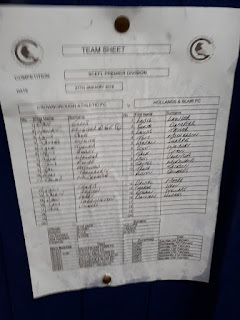 With the pitch in a very slippery and muddy state from the ongoing deluge, the opening proceedings were slow and cautious, with both teams testing things to see what they could do despite the conditions, while also probing the opposition defences to find the gaps in them. As such, the first fifteen minutes or so were largely uneventful, with each side only having a few half-chances. The first notable incident was a mass brawl - one of many scuffles (of varying scales) in this game - after around 10 minutes, when a sliding tackle on a Crowborough player provoked an angry reaction, which then pulled in the rest of the players and caused the entire situation to almost escalate completely out of control. Fortunately, this incident didn't take too long to calm down after the initial scuffle, but the referee set the precedent by booking nobody, rather than meting out proper punishments for the brawl. After this, Crowborough started to take control of the game and turn the screw, pinning H&B back into their own half for a period. Crowborough then had the ball in the net after 17 minutes, but Zac Attwood's effort was disallowed for offside. 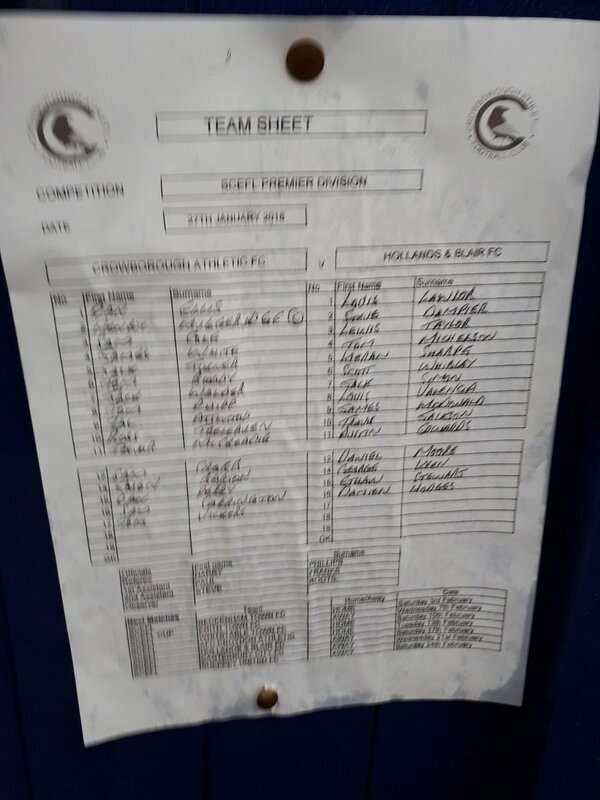 However, it was becoming clear that it was only a matter of time until Crowborough took the lead and, after a few more good chances and a couple more minor scuffles here and there, they finally had their first goal after half an hour: debutant Trevor McCreadie had space in the box and slotted home from ten yards out. While I say that the goal had been coming, it would be wrong to say that Crowborough were especially comfortable at this point as, while they did generally look more likely to score, H&B were having a few good chances here and there, but seemed to consistently take a moment too long to shoot, allowing a Crowborough defender to get back and clear or intercept with a last-ditch tackle (Crowborough were playing a very high defensive line, so H&B were able to carve out a few chances with the ball over the top); considering their struggle at the bottom of the league, this is not surprising and clearly indicates an understandable lack of confidence. In any case, the last major talking point of the first half came with another major scuffle on 40 minutes, with this one finally being met by the first yellow card of the game, H&B's Scott Whibley being the man to end up in the book: with some of the tackles flying in (not helped by the slippery conditions, admittedly), and some of the reactions to these (one that stood out to me is a Crowborough winger being tackled on the edge of the box and, in response, pulling the leg of the H&B defender to bring him to the floor as well), it would have been appropriate for each team to have at least 2-3 players booked to try and curb the bad-blood, but the referee was far too lenient and indirectly contributed to such incidents continuing to occur throughout the second half. 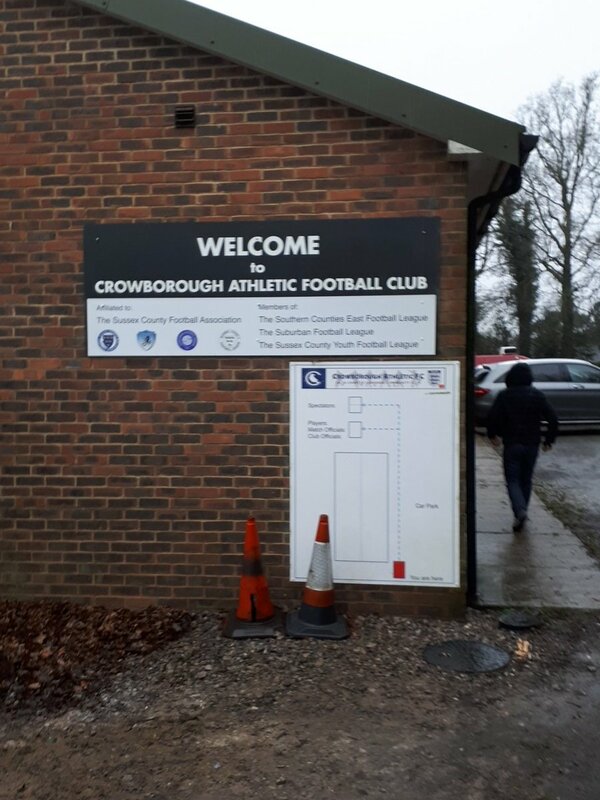 In any event, Crowborough went in 1-0 up at half-time. With the rain having been falling all game so far, the second half started in much the same vein as the first, with the play being reasonably cautious and conservative and with some big tackles flying in, followed by a yellow card for H&B's Steve Dampier on 53 minutes. However, as in the first half, Crowborough started to exert some control over proceedings, and it was not at all surprising when Zac Attwood doubled their lead on 57 minutes, going on an excellent run before having his shot slightly deflected on its way in. Unlike the first half, though, this saw Crowborough almost take complete control of the game, starting to string together chance after chance while effectively stifling anything H&B could do to try and pull one back. However, my honest appraisal of the 20 minutes after the second goal is that the only side who looked like they wanted to score at this point was H&B, with the home side seeming to be more than happy to maintain their two-goal advantage rather than pushing for more (understandable after back-to-back losses in the FA Vase and league, I suppose). An incident on 79 minutes seemed to change the Crowborough mindset, with Jack Walder suffering what looked to be a serious injury (I'm not sure how this happened, but I would assume it was caused by a tackle that, because of how slippery the pitch was, ended up with far more force behind it than intended). He was eventually replaced by Tom Vickers on 82 minutes and this seemed to spark Crowborough into action as, just two minutes later, captain Henry Muggeridge set through Dan Perry to slot the ball under H&B goalkeeper Louis Lawlor to make it 3-0 to the home side. At this point, the game was over and, despite a couple of decent chances for H&B in the final few minutes, Crowborough were able to endure and keep the clean sheet. Overall, this game can be best described as a workman-like performance from Crowborough, with them seemingly doing the bare minimum needed to win against a Hollands & Blair side who battled their hardest to try and get something out of the game, but ultimately didn't have enough to do so. However, I would say that they looked like a far better side than I expected considering their position in the league, and in fairness they never gave up at all: they're bound to pick up more points playing the way they did today, but whether that'll be enough to stay up is a different matter. Overall, while the traveling was a pain (and not just because of the constant deluge), this was an enjoyable day out at a ground I've been eager to visit and a club who came across as extremely friendly as well. Compared to the last few grounds I've ended up visiting, the Crowborough Community Stadium was a massive step-up on all levels. For the first time since Waltham Forest, there was hard standing on all four sides of the ground, and in addition to this there was four separate areas of cover, albeit only on two sides of the ground (realistically, there doesn't look as if there would be enough room on the dugout side or behind the far goal for any football furniture, and besides the available cover was sufficient and much-appreciated on such a wet day). Behind the near goal is an impressive covered terrace which spans almost the entire length of the near goal and could probably hold 500 people if the need ever arose. The rest of the cover is on the near side, with a covered Atcost terrace providing covered standing for around 50 people, a 50-seater Atcost stand and an impressive 100-seater main stand between the Atcosts. The ground's overall capacity is 2,000 and, by the looks of it, would almost certainly be good enough for Step 4 (unsurprising considering the club has been at that level before, albeit only for one season) or, if not, isn't far off being good enough. There's also a decent amount of room to expand on the near side if necessary, but not many other options on that front at the current site.